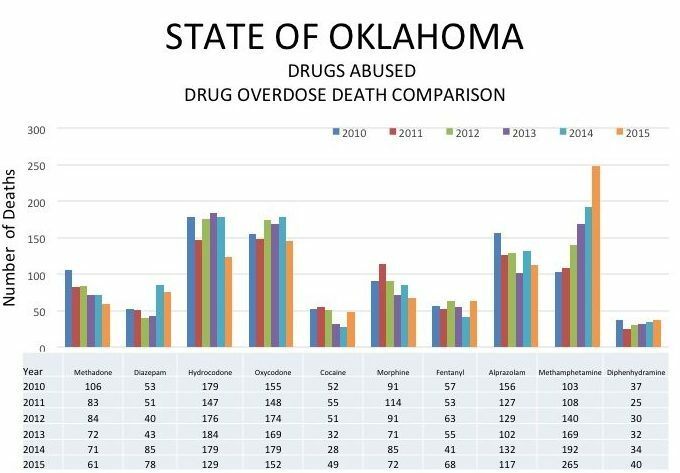 Drug law enforcers and medical professionals said they were both encouraged and alarmed by the latest overdose death data, generated by the Office of the Chief Medical Examiner and compiled by the Oklahoma Bureau of Narcotics. The encouragement comes from increasing evidence that tougher oversight and outreach are causing the toll of prescription drug overdoses to stabilize and decline slightly. “Deaths are down because of greater use of the Prescription Monitoring Program and greater awareness by physicians, through conferences, through training, through just networking,” said Narcotics Bureau spokesman Mark Woodward. The alarm stems from a troubling rise in methamphetamine and heroin deaths, some of which might be attributable to former prescription drug users switching to cheaper bootleg drugs. Heroin has been making a comeback across the country. The latest data suggests that Oklahoma drug users are beginning to make that transition, too. –The total number of deaths officially attributed to overdoses dipped to 823 in 2015 from 870 the previous year. From 2001 to 2010, the number of fatal overdoses increased 137 percent, from 344 to 814. Since 2010, the annual death toll has increased only 1 percent. –Prescription benzodiazepine tranquilizers continue to be a factor in many overdoses, showing little change over five years. 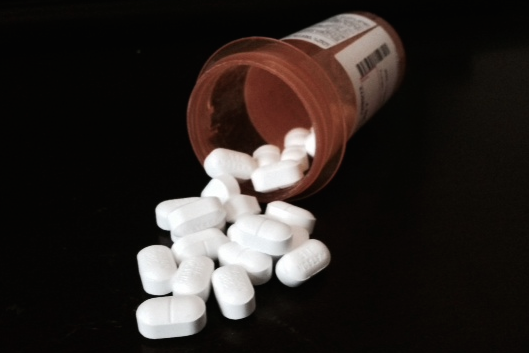 Alprazolam (Xanax) and diazepam (Valium) contributed to 195 deaths last year, or 24 percent of total overdoses. “Benzos” are seldom lethal by themselves but can be deadly when combined with opioids or alcohol. 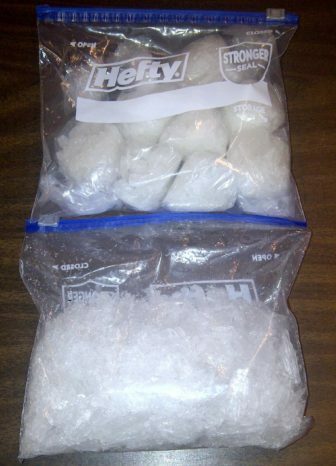 These bags of Mexican ‘Ice,” or methamphetamine, were seized by the Oklahoma Bureau of Narcotics and Dangerous Drugs. –Methamphetamine overdoses are soaring. They accounted for 265 deaths last year, or nearly a third of all fatal overdoses. The total represented a 157 percent increase since 2010’s death toll of 103. The fatality count keeps climbing despite a dramatic decline in the number of Oklahoma meth lab busts. Officials attributed the change to surging imports of Mexican meth. –Heroin overdoses might soon account for 1 in 10 opioid-related deaths in Oklahoma. They increased to 31 last year from only 12 in 2011. So far in 2016, they are on track to hit 40 or more. Health experts said the increase reflects the rising cost of prescription painkillers as well as increased imports by Mexican cartels. “We’re seeing an increase in heroin because of the cost of Oxy (oxycodone),” said Hal Vorse, a physician who treats addicts at a clinic in Oklahoma City. Vorse said prescription oxycodone is currently selling on the street for $1 to $1.25 per milligram. A frequent user might need as much as 100 milligrams a day just to ward off withdrawal symptoms. 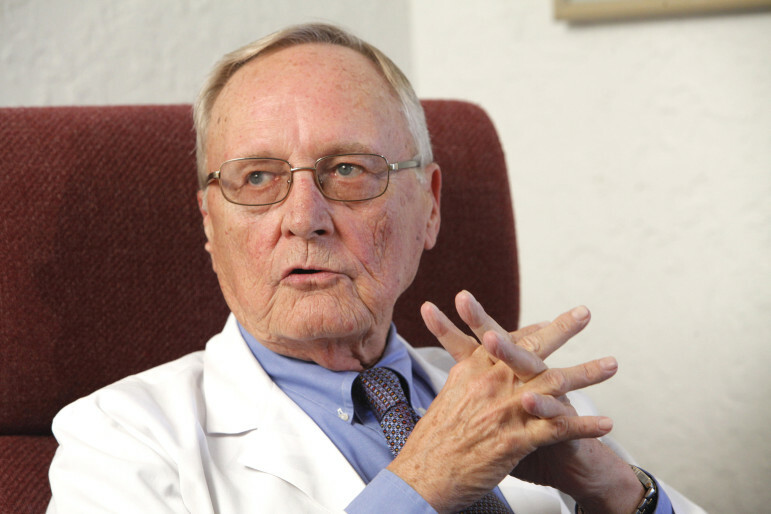 Dr. Hal Vorse of Oklahoma City specializes in the treatment of addiction. The rising use of black-market drugs such as methamphetamine and heroin appears to be an unintended, if perhaps unavoidable, consequence of concerted efforts to combat the significant increase in prescription drug abuse over the last two decades. They cited several changes in recent years. First, a new law that took effect in November 2014 reclassified hydrocodone “combo” painkillers such as Lortab and Norco as Schedule II controlled dangerous substances. That meant doctors could not write prescriptions for more than 90 days and could no longer phone in prescriptions to pharmacists. Another new law enacted in 2014 expanded the ability of emergency medical personnel and family members to administer Naloxone, a drug that reverses the effects of opioid overdoses. Its increased availability is believed to be reducing the number of fatal overdoses among people who continue to abuse dangerous drugs. Yet another new law that took effect in November 2015 requires doctors to check the state’s Prescription Monitoring Program database at least once every six months before prescribing opioid painkillers or benzodiazepine tranquilizers. That helps them spot abusers who are obtaining overlapping prescriptions from other doctors. The latest counts of drugs involved in fatal overdoses in Oklahoma show a dramatic spike in 2015 in methamphetamine-related deaths and a dip in cases involving the most frequently abused prescription opioids, hydrocodone and oxycodone. In many cases, multiple drugs contributed to the death. Meanwhile, extensive coverage of prescription drug abuse and more aggressive education programs aimed at health professionals and patients have heightened awareness of the overdose crisis. In addition, tougher enforcement actions, including highly publicized criminal prosecutions of overprescribing physicians and shutdowns of high-volume “pill-mill” clinics, might be causing doctors to exercise more caution. “Probably the biggest impact is just more physicians becoming aware that this is a big issue,” said Lyle Kelsey, executive director of the Oklahoma State Board of Medical Licensure and Supervision. “I think it’s really starting to settle out into two categories – those (doctors) that play the game and want to rack up a bunch of money and get out … and those that are trying to take all of the knowledge and say, ‘How can we do this right?’” Kelsey said.